"We are just a typical retired couple trying to make the best of our retirement on a very meager Social Security income. When God chooses to take us from this Earth, we have wishes and desires concerning our estate and our children. Unfortunately, we procrastinated on getting our affairs in order because of expense, and it really just seemed like too big a deal! Then we received an invitation to a “free lunch” and seminar. We needed some direction and answers to our questions - and, of course, a “free lunch!” There we met Justin T. Crain, an attorney with Thomas Walters, PLLC, and a homegrown West Texas boy graduating from Texas Tech in Lubbock. Being from Lubbock ourselves, we just really “clicked” with Justin. He seems very sincere about wanting to help us to fulfill our needs and wishes concerning our estate, and he is willing to work with us financially. He has walked us through a “simple process” and has provided us with an “affordable customized plan” to fit our needs and desires. Thanks to Justin’s expertise and his willingness to listen and spend time with us, we now have peace of mind that the handling of our estate will not be a burden for our children and our desires will be met. We have placed our trust and confidence in Justin and will highly recommend him and his services to everyone! Justin Crain is an estate planning attorney in the Plano, Texas office of Thomas, Walters, PLLC where he provides legal services to those in the surrounding areas of North Texas. Justin helps families develop a customized and comprehensive strategy to address their unique needs, concerns and goals. "I believe that a professionally developed estate plan will provide peace of mind and make the transitions through generations easy and cost efficient." In 2009, Justin Crain graduated from Texas Tech University School of Law with his Doctor of Jurisprudence. He is a licensed attorney with the State Bar of Texas, a licensed Risk Manager and licensed Agent with the Texas Department of Insurance, and holds the Associate Risk Manager designation with the American Institute for Chartered Property Casualty Underwriters. 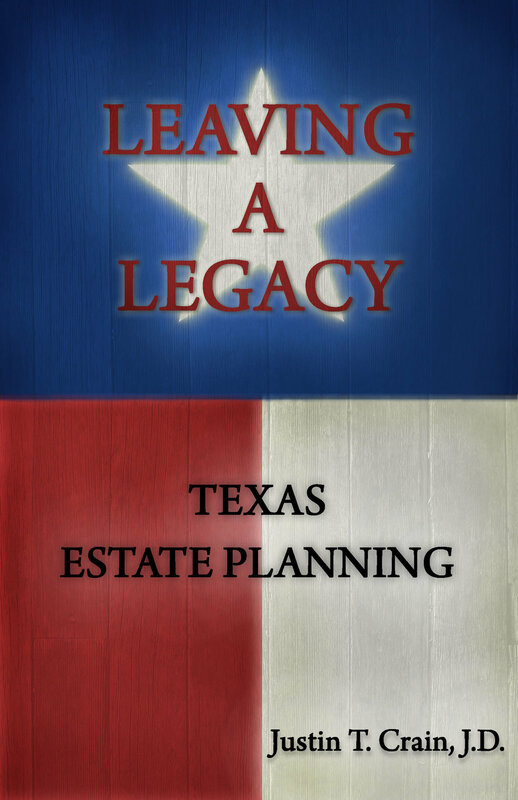 Justin is also the author of the book, Leaving A Legacy - Texas Estate Planning. He is currently a Partner and Estate Planning Attorney with Thomas Walters, PLLC where he is often asked to speak at conferences and seminars regarding important estate planning issues. Justin practices exclusively in estate planning and settlement and is a member of the State Bar of Texas’ Real Estate, Probate and Trust Law Section and the National Academy of Elder Law Attorneys. Your Free Chapter is On It's Way! Thank you! You will be receiving a free copy of the information you selected shortly! Is Estate Planing For Everyone? In early 2016, Prince died with an estate valued in the millions of dollars with no plan of any kind in place to help establish beneficiaries and direct the disposition of his assets. Many famous people have died without plans in place, including Abraham Lincoln and Texas billionaire Howard Hughes. In fact, a majority of Americans have not taken any steps to plan for their estates. A 2015 Harris Poll stated that 64% of Americans have not taken any steps to plan for their estate and other surveys indicate that up to 75% of Americans die without even establishing a will. Most people say they are too busy, that planning is too complicated or, commonly, that “I’m not rich enough to need an estate plan.” The truth is, if you have a home or any other assets that you want to ensure go to who you want and how you want when you die – you need an estate plan! A majority of people and families procrastinate when it comes to estate planning. We don’t want to talk about it, and besides, we all know that nothing bad will ever happen to us and that even if it does, that’s going to be ten or fifteen years in the future – or at least we all have the hope that those sentiments are true. The fact is, we all know someone, and in fact as you read this book, you may be that person or family member or friend that experienced the unexpected. Whether it was a fatal or incapacitating car accident, an unknown medical condition, or some other unknown event that affected you and your loved ones – it is a myth, no matter how common it may be, that estate planning is only for someone older than I am with more money than I have. None of us can predict how long we will live. It may be true that some wealthy individuals may be more likely to think about ways to preserve their assets, but those with a more modest estate should also make it a priority because they can afford to lose the least. Procrastinating could cause tremendous turmoil and confusion when you die and your loved ones will be left to pick up the pieces. When you are ready to plan out your estate or if you have been named a trustee or executor in Texas, no matter where you live, call our law firm at (972) 560-6288 or use the form below. We will gladly arrange a consultation to discuss your will, trust, estate, disability, or probate needs. The Plano, Texas Office and Justin T. Crain serve North Texas including the cities and towns of: Addison, Allen, Anna, Blue Ridge, Carrollton, Celina, Copeville, Coppell, Dallas, Fairview, Farmers Branch, Farmersville, Frisco, Garland, Hebron. Irving, Josephine, Lavon, Lewisville, Lowry Crossing, Luca, McKinney, Melissa, Mesquite, Murphy, Nevada, New Hope, Parker, Plano, Princeton, Prosper, Richardson, Rockwall, Royse City, Sachse, Saint Paul, The Colony, Van Alstyne, Weston and Wylie.